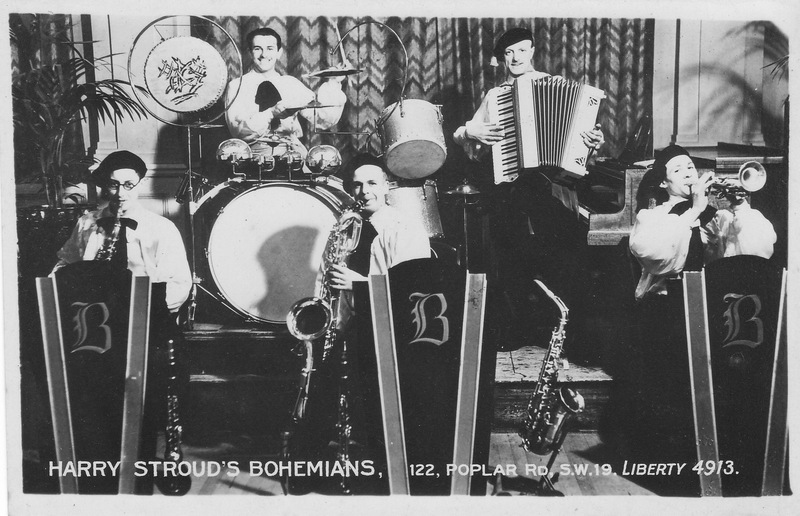 This is the band lead by the second husband of my grandmother, "Mrs Stroud". She had started out as Lillie Nunns, married a Clarke, was widowed and married a Stroud. She occasionally played double bass for this outfit, though she had to stand on a box to do so. 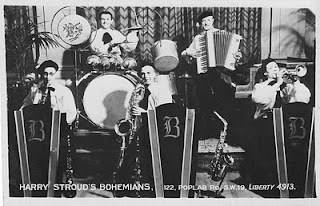 Should anyone know anything about Harry Stroud's Bohemians I'd love to learn it. Harry himself is on the accordion. In recognition of the tremendous pleasure that the latest series of Dr Who has given me, I hereby post this recently discovered photograph of a rune clearly depicting a dalek, with the startling message "I am the Dalek Supreme" inscribed above. 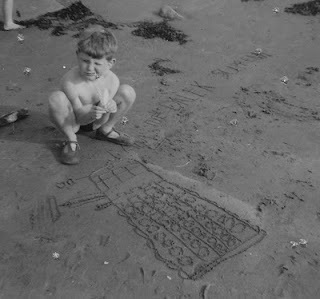 The photograph dates either from around 1965 or of course 10,965 or even One Million Years BC. As for the handsome young archaeologist squatting proudly above his discovery - can't think who he is. Following the last post, here is some good news. It seems the old left is not so besotted with totalitarian terrorists as are the bien-pensant Pinterites and Guardianistas. Well, they have a fine football team, but, not unlike many other countries in Europe, a growing problem with anti-semitism. A recent episode is reported here. A neutrino is capable of passing through about six trillion miles of lead without hitting a single atom. Not unlike Dan Carter through the Welsh rugby team. In the 8th century the Islamic alchemist known as Geber decided that arrangements of the qualities hotness, coldness, dryness and wetness made up all the metals, and that therefore their rearrangement could mean that one metal could be turned into another. In order to make these rearrangements it was necessary to use some kind of agent. 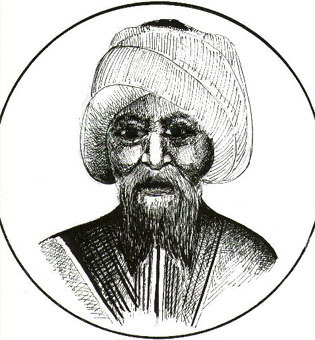 This agent, or substance, was called al-iksir - elixir - and its source was the legendary "philosopher's stone". Geber was undoubtedly brilliant, but wrong. So was Newton, who was still trying to change lead into gold almost a thousand years later. Thought i'd helpfully share this with y'all. All Blacks stupendous. Dan Carter could play in any position and their new wing is as good as Rockoko. This is odd. Is it a set up? I suppose it must be. If so it is extremely well done. But to what end? This morning I came upon the following paragraph in a story by William Maxwell. I think it is remarkable, so I am going to share it with y'all. "The tragic heroine takes everything into consideration. That is her trouble, the thing that paralyzes her. While her lawyer is explaining to her the advantages of separate maintenance over an outright divorce, she considers the shape of his hands and how some people have happiness while they are young, and then,later, nothing but unhappiness." There seems to me to be so much in these lines that we hardly need a story into which to place them. It is also rhythmically satisfying: I love the staccato of commas towards the end, following the long clauses. Marvellous. The paragraph is from 'The Trojan Women' by William Maxwell. 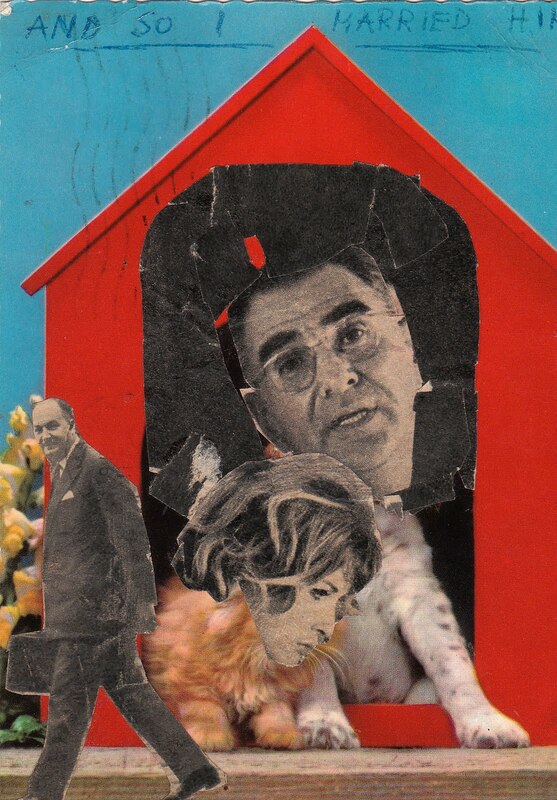 "AND SO I MARRIED HIM"
This is a hitherto unseen collage by the distinguished novelist and writer on art, John Berger. I came upon it going through old postcards my parents had been sent in the 1960s. My mother, Jacqueline Wheldon, wrote the blurb for the Booker prize-winning 'G', and my father invited John to do several films for 'Monitor'. What I personally chiefly remember about John was his motorbike and his leather jacket, and his rich, lisped and gnarling voice. Wonderfully civilized hero and heroine, quoting Browning and bantering with high facetiousness. Usual Hubbard stuff involving earth works and pagan practices. I really think that almost no-one has ever described the English countryside so well - or perhaps it would be more accurate to say the geography of the countryside. Place is absolutely everything in Hubbard's books and he is at great pains to put you in the picture. And my, he does sinister very very well. Some people thought P M Hubbard was Isaiah Berlin but when he was asked directly he said "if I were, would I tell?"